The Ti–system is a fixation system for membranes and foils. The non–resorbable Ti–Titanium pins combine all of the handling advantages of nails and screws (“tap in – screw out”). The Ti–system provides a convenient option for securing all foils and membranes for bone grafting surgery safely, quickly, and easily – and also for removing them again safely, quickly and easily. The Ti–Titanium pins (made of grade 5 titanium) are available in two lengths: 3 mm for use in normal bone and 5 mm for use in very fragile bone. The pins are rendered absolutely neutral by electrochemical passivation, and thus contribute to irritation–free healing and to uncomplicated bone regeneration. The practical steribox, which is also an important component of the Ti–system, is used for storing, sterilizing and insertion into the setting instrument. 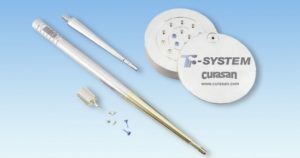 All components of the Ti–system can be ordered separately; the pins are available in 5 pack and in an cost-effective 10 pack. Thanks to precise pinning, the Ti–titanium pins can be quickly and reliably installed in the bone — without pre–drilling! The Ti–Titanium pins are removed smoothly and gently using the internal hexagonal key. This is facilitated by the screw thread under the head of the innovative Ti–Titanium pin and corresponding key.